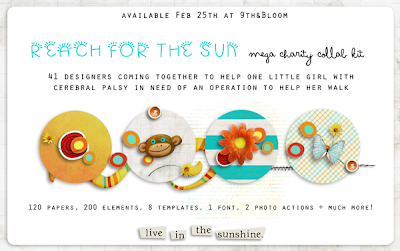 I was asked to participate in a mega charity collab kit coming Friday the 25th (this Friday) to 9th&Bloom! Here is a little sneak peek for you. I'm one of forty-one designers who signed on to help Vicky. The kit is jam packed with 120 papers, 200 elements, 8 templates, 1 font, 2 photo actions and more! The colors are bright and happy and will help you while you're scrapping your Spring and Summer pictures. To learn more about Vicky, take a look at the website her mother has created ~ HELP VICKY. Please consider purchasing this collection to help this little girl. Stay tuned to 9th&Bloom in the For Charity section of the shop here: 9th&Bloom For Charity!